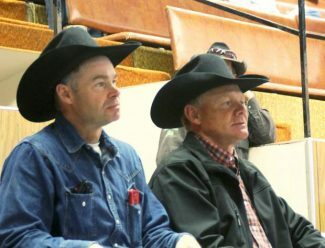 Billy Olson and Harold Miller, Mud Butte, South Dakota. Robert McMurry from the East Gate Ranch at Casper, Wyoming, purchased the top bull, Lot 19, at $6,500. Kris and Rick Jordan, Sturgis, South Dakota. Tim and Ree Reich of Reich Charolais hosted a crowd of mostly repeat buyers for their annual bull sale at Belle Fourche Livestock. This herd has stood the test of time by breeding cattle that they like, and cattle that work for their customers. There are several of these buyers that have been there before I was. The Reich bulls last…and work for their customers over a long period of time. This year's set of bulls were well grown and packed full of muscle. They had an average birth weight of 86.6 pounds, and an average weaning weight of 733 pounds with no creep. These bulls are bred to produce calves that are born unassisted, and are vigorous and strong to get up and grow on their mothers' milk and grass with no extra feed. 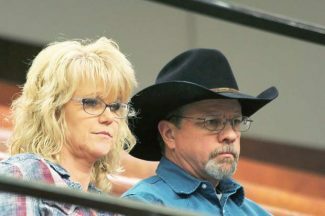 Tim and Ree Reich offer an unconditional guarantee on their bulls, and they keep them until mid May with free delivery. This year's sale was active and every bull found a new home. Top selling bull of the day was Lot 19, selling for $6500 to the East Gate Ranch from Casper, Wyoming. 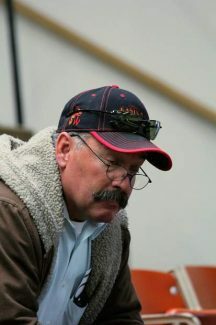 Robert McMurry was at the sale to select this top bull. He was a thick-made, big-topped bull with an 83 pound birth weight. He weaned at 855 pounds to ratio 121, and reached a yearling weight of 1,490 pounds to ratio 120. Sired by Eatons Dividend 20042 Polled, he was out of a dam by CJC Royal Turn U447. His EPDs were CE 7.0, BW -0.2, WW 44, YW 81, MILK 6, MCE 7.4, TM 28, CW 19, and REA 0.39. With a 39 cm. scrotal measurement, he scanned a 15.6 square inch rib eye and an IMF ratio of 139. Louder Farms from Draper, South Dakota, are repeat buyers, coming back each year to add the Reich genetics to their program. They topped their purchases with Lot 36 at $5250. He was a son of BHD Sir Halfours A518, and out of a dam by SVY Bedrock. Born at 91 pounds, he weaned at 828 pounds to ratio 117, and reached a yearling weight of 1405 pounds to ratio 113. He measured a 43 cm. scrotal. Louder Farms also bought Lots 14 and 43, at $5,000 each. The Lot 14 bull was a son of BHD Sir Halfours and out of a Swegle Creek Stake bred dam. Entering the world at 89 pounds, he weaned at 806 pounds to ratio 114, and posted a yearling weight of 1360 pounds. His EPDs were BW 3.1, WW 44, YW 71, and RE 0.40. The Lot 43 bull was also a son of Halfours. His mother was a daughter of Eatons Traceable 9448. Born at 96 pounds, he weaned and 740 pounds and attained a yearling weight of 1385 pounds to ratio 111. He gained 4.03 pounds a day on test to ratio 120. Lot 51 brought $6,000 from Wade Harvey of Minot, North Dakota, as he continues to purchase these bulls year after year. Sired by BHD Sir Halfours A518, he was out of a dam by LHD Class W 1239. He hit the ground at 89 pounds and began to grow, reaching a weaning weight of 808 pounds and a yearling weight of 1,435 pounds to ratio 115. As always, there was a special treat of glazed donuts that only Ree Reich can produce.